You should read this if you operate a business. This document is from CalChamber. If you own a hair, fitness or services-based business in Ladera Ranch or Rancho Mission Viejo that utilizes independent contractors you should know how those people are defined is now being tested by a court ruling last year. "The Dynamex Operations West, Inc. v. Superior Court decision by the California Supreme Court in April 2018 overturned three decades of California employment law that allowed individuals to work as independent contractors. This decision could upend how millions of Californians earn a living and nearly every industry due to its new restrictive ABC test. The ABC test is the first time in U.S. history that such a test has been imposed by a court, without legislative approval, with three independently disqualifying factors" (from I'm Independent Coalition). At the Chamber, we try hard to separate ourselves from any topic relating to politics - unless we are sure the result would negatively impact our local businesses. In this case, it appears the Dynamex decision would do so. Bottom line, EDUCATE YOURSELF and schedule a consultation with your accountant. On Wednesday, January 16th, our Chamber hosted it's monthly Chamber Chat in U.S. Bank's Community Room. 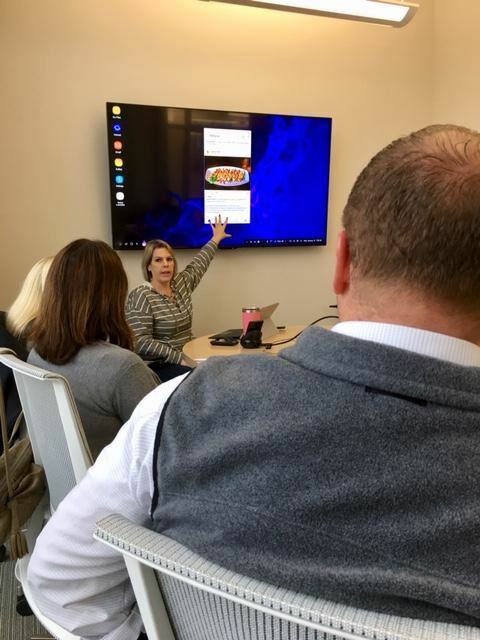 The topic was how to use social media - Instagram in particular - to grow your business, hosted by Civic Council Chair Stephanie Ramsey who concedes she is a social media junkie and uses it more than her teenage kids do. 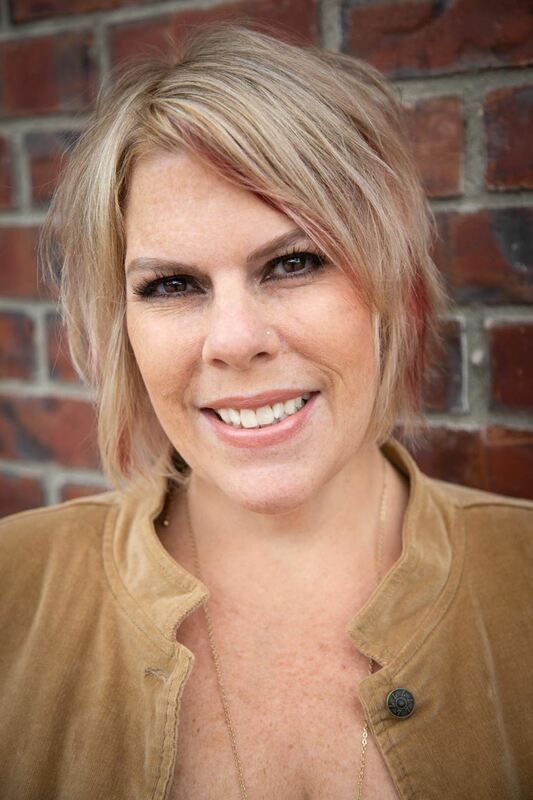 She's so good in fact, she has started her own social media consulting business: Social Beeing - Make Your Business Buzz! Did you know that Instagram has over 1 billion monthly active users and that 71% of US businesses use Instagram? By using social media, you can put your business literally in the hands of your customers. Unlike print advertising, you get the opportunity to interact with your customers and create a personal relationship, and brand loyalty, sometimes before they ever make a purchase! This is particularly significant since 30% of Instagram users have purchased a product that they discovered on IG! If you already have an account, make sure it is a business account so you can get analytics on your followers. Don’t mix business and personal accounts together. Your customers, although they may enjoy your vacation pics, are following you for relevant content to your business. Set your strategy. Look at your competitors and see what is works for them, more importantly, what isn’t working. Build your content. There are lots of apps out there that you can use for free. Check out Canva, Ripl, Spark Post. Look into a branded hashtag to help with user-generated content. For example, Mazda uses #zoomzoom and their brand enthusiasts post photos with this hashtag. It spreads the love. Have a call to action in your posts. Shop this style. Make an appointment. Come in and see. Engage your users. This is really important to building that relationship. Repost user-generated content about your brand. Comment back. Respond quickly. Instagram users like the personal connection with companies and brands. Connect with other influencers. Follow industry leaders and look for collaboration opportunities. Give the people what they want! This could be expertise, a discount, contest, etc. An occasional perk of being your follower and inviting their friends to follow you will help win hearts and minds. Social media is an easy and inexpensive way to have a direct connection with your customers. Have fun and enjoy the journey with your fans! Social Beeing – Make Your Business Buzz! Ever wonder what Business-related bills come before the California Legislature and how our elected representatives vote? Pat Bates voted in accordance with the Cal Chamber recommendation 14 times -- the highest of any representative in the Senate - and Bill Brough also voted in accordance 14 times in the Assembly. Thank you representatives! Our businesses appreciate it! Click the link below to see info from Cal Chamber! 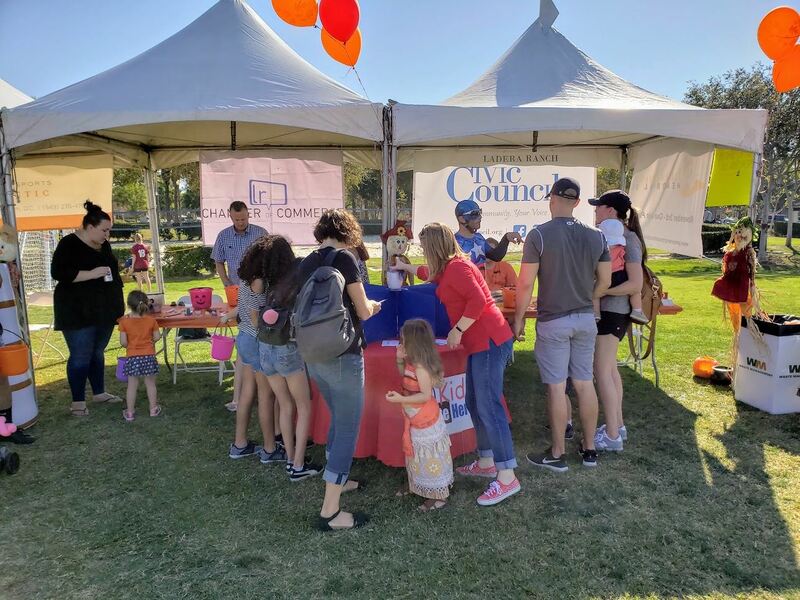 Chamber brings Early Voting to Ladera! State of the Community is in the books! 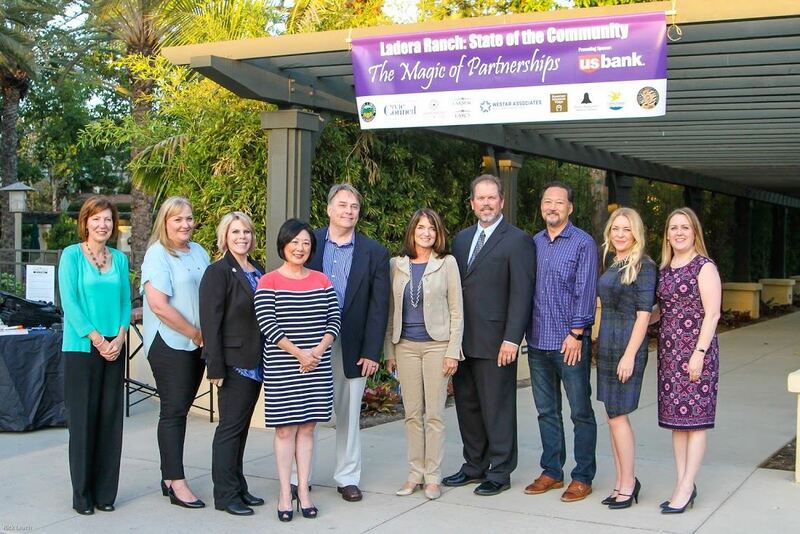 After six months and hundreds of volunteer hours, the Ladera Rancho Chamber of Commerce and the Ladera Ranch Civic Council hosted our first STATE of the COMMUNITY since 2013. It was a smashing success as residents heard updates from elected officials and representatives including Orange County Supervisor Lisa Bartlett, CUSD Superintendent Kirsten Vital, Orange County Sheriff Sandra Hutchens, Rancho Missin Viejo VP Michael Balsamo, Westar COO Jud Dutrisac, Santa Margarita Water District Jim Leach, LARCS, LARMAC and of course the Civic Council and our Chamber. Click the link below to see pictures from the event. Pics provided by our awesome photographer and Chamber member Rick Leach (rkleach7@gmail.com) of F45 Gym in the Sendero Marketplace! 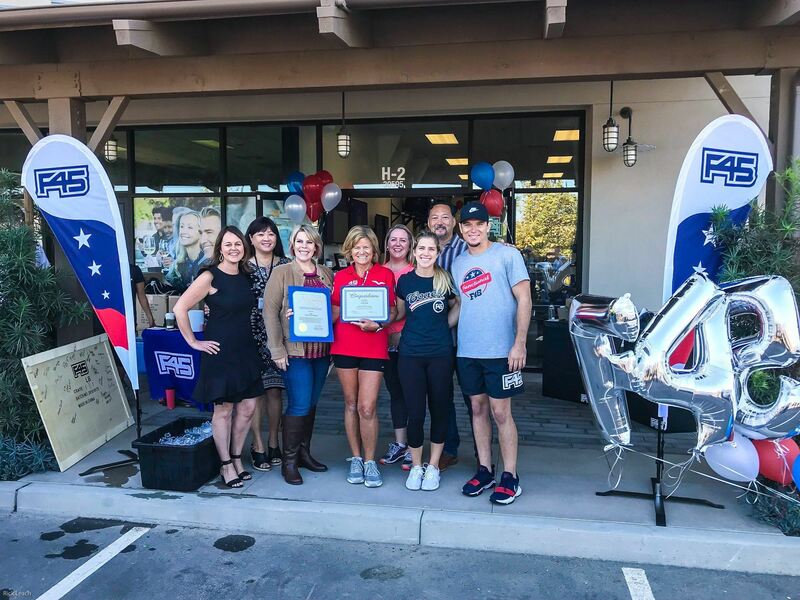 F45 Opens in RMV to Shape you up! Some businesses join and and then we don't hear much from them. NOT the case with F45 in Rancho Mission Viejo! They joined our Chamber in July and have been regular participants at all of our events. We ❤️ that engagement! So it was a special day when we helped cut their ribbon and officially open their doors to the public! Quite simply, they are awesome! Go see them to get yourself in rocking shape! See all of the pics here! State of the Community is BAAAAACKKKK! 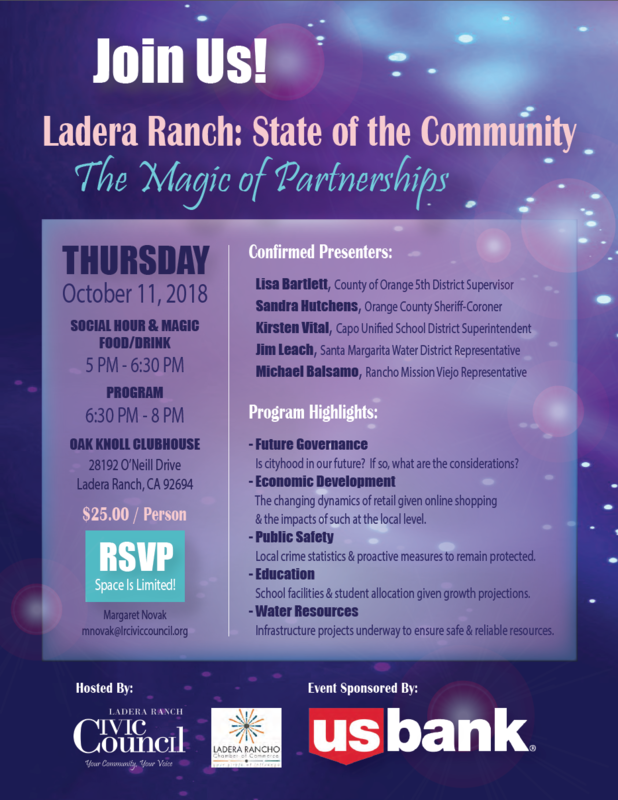 The Ladera Rancho Chamber of Commerce, in partnership with the Ladera Ranch Civic Council, is excited to return our once annual State of the Community to THE LAND OF THE LIVING! More deets to follow but it is going to be AWESOME! We had the absolute honor to cut the ribbon to U.S. Bank’s new branch in Mercantile West last Wednesday. Not only is the new location AWESOME, the staff rocks and they have the coolest ATM ever. But more importantly, they want to be PART of our community – and they walk the walk. 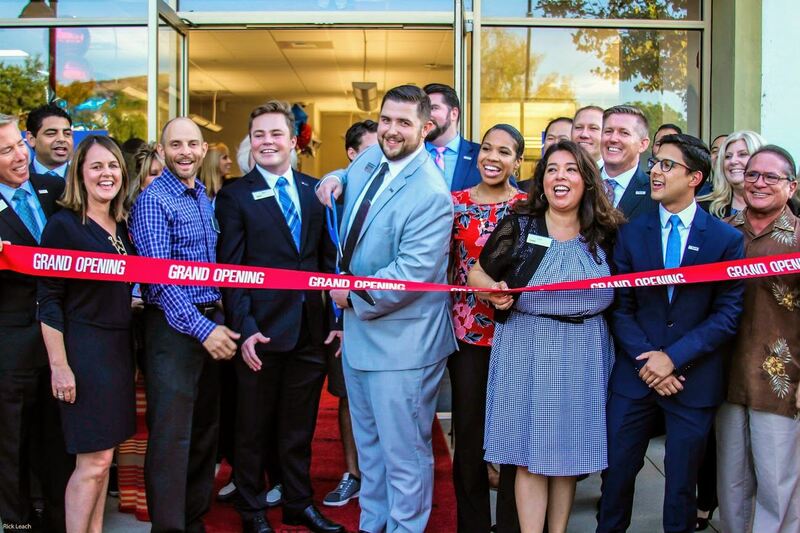 Whether it’s their new reservable community room, the fact that they held a customer appreciation lunch AND a pet adoption event on different days of the SAME WEEKEND or the that they’re sponsoring our State of the Community Event October 11th, U. S. Bank has set the standard for community integration. And everyone in Ladera should go to them for all of their banking needs. Thank you U.S. Bank for being a PARTNER to this community! We look forward to a LONG, healthy relationship with you! Best of luck!